This article is about the group of items in the Mario Kart series. For the minigame in Mario Party 3, see Game Guy's Lucky 7. A red number seven, as seen in the game's logo. Grants the racer seven items to use in the race. The Lucky Seven is a special item that appears in Mario Kart 7. It is depicted as a red number "7", matching the one from the game's logo. 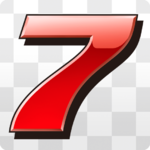 The name originates from a symbol on slot machines, where three sevens results in a jackpot. In Mario Kart 8 a very similar item called the Crazy Eight appears, and it functions identically to a Lucky Seven, except it gives the player eight items instead of seven (with the eighth item being a coin). The Lucky Seven debuts in Mario Kart 7. It is one of the items that can be found from the Item Boxes by racers in approximately fourth to seventh place, with a rarity on par with the Spiny Shell. When used, seven items appear surrounding the racer's kart rotating similarly to the Triple Green or Red Shells. The racer can then use them one by one; the item used is the one closest to the front of the kart. The Lucky Seven spawns a Banana, a Green Shell, a Red Shell, a Mushroom, a Star, a Blooper, and a Bob-omb. If the item settings in VS or Battle modes are set to Shells Only, Bananas Only, Mushrooms Only, or Bob-ombs Only, then all seven items will be the dominant item. If Shells Only is on, the player will have seven Red Shells. Like Triple Green or Red Shells, opposing racers that get too close are hit by the circling items. As one would expect, a Banana or Shell simply hits the opponent, while Mushrooms or Stars give opponents their boost, and a Bob-omb explodes and takes out any items that had yet to be used. A collision with the Blooper will put a single splotch of ink on the opponent's screen. In normal racing, only the player characters can use the Lucky Seven, similar to how Triple Red Shells are normally a player exclusive item. In other item settings in VS or Battle Mode, however, the AI is able to use the Lucky Seven. If the Lucky Seven is active underwater, the Blooper will leave a trail of ink bubbles. The image in the roulette retains the checkerboard background, being the only item to have a background of its own in the roulette. When the Lucky Seven is received, it plays the sound effect heard when receiving a powerful item like a Star in Mario Kart DS. This page was last edited on January 21, 2019, at 22:13.